Apple Park's Steve Jobs Theater. 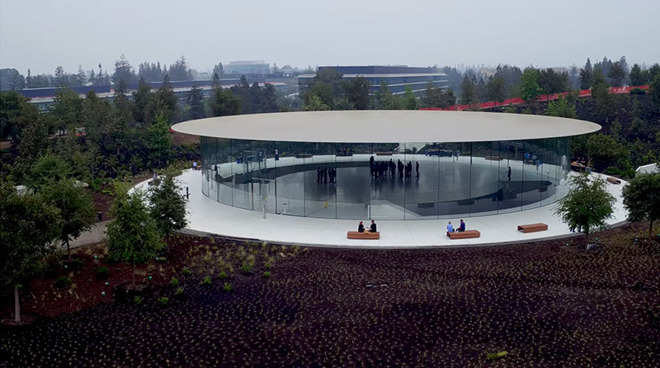 According to Apple's Proxy Statement, filed with the U.S. Securities and Exchange Commission on Tuesday, the company will host shareholders of record at Apple Park on March 1 at 9 a.m. Pacific. The record date for the gathering is Jan. 2, 2019, meaning stock holders who held positions at that time are welcome to attend and cast their vote on proxy proposals. While shareholder meetings are typically announced through compulsory SEC filings like the document issued today, Apple gave early warning last year, as that gathering was the first to be held in the relatively small Steve Jobs theater. It appears Apple has returned to normal operating procedures for 2019, though the company requests shareholders register in advance through proxyvote.com starting at 8 a.m. Pacific on Feb. 6. As usual, seats are available on a first-come, first-served basis. Items of business include the election of the firms' board of directors, with Apple presenting nominees James Bell, Tim Cook, Al Gore, Bob Iger, Andrea Jung, Art Levinson, Ron Sugar, and Sue Wagner. Shareholders will also cast ballots to ratify Ernst & Young as the independent registered public accounting firm for 2019 and vote to carry forward the current executive compensation plan. On compensation, Apple notes CEO Tim Cook reaped an annual compensation of $15,682,219 in 2018, some 283 times the $55,426 median earning of an Apple employee. Two shareholder proposals are on the docket for March, both of which have been incorporated into recent proxies. The first, listed as Proposal 4, is a shareholder proxy access amendment that seeks to amend current company bylaws to grant shareholders a second nominee to the board. Apple's current proxy access regulations limit access to 20 percent of immediately serving directors rounded down to the nearest whole number, which comes out to one director. The proposal would change that language to reflect a 20 percent figure "or 2, whichever is greater." Apple recommends voting against Proposal 4 on the basis that the existing method of proxy access has been deemed effective. Further, forcing a second shareholder-nominated director could "have serious unintended consequences, putting the company and shareholder value at risk," Apple says. The proxy access amendment has been submitted every year for the past five years, but has failed to receive majority support. A second shareholder proposal requests the board adopt a policy that discloses, in Apple's Proxy Statement and on its website, a "description of the specific minimum qualifications that the Board's nominating committee believes must be met by a nominee to be on the board of directors; and Each nominee's skills, ideological perspectives, and experience presented in a chart or matrix form." Proposal 5 was submitted by the National Center for Public Policy Research. "We believe that boards that incorporate diverse perspectives can think more critically and oversee corporate managers more effectively. By providing a meaningful disclosure about potential Board members, shareholders will be better able to judge how well-suited individual board nominees are for the Company and whether their listed skills, experience and attributes are appropriate in light of the Company's overall business strategy," the proposal reads. Apple recommends a vote against Proposal 5, arguing that existing board management system incorporates self-evaluation processes. More pointedly, the board is nominated based on skill, experience and other attributes needed to ensure success, not "ideological perspectives," Apple says. Wow! I had no idea it was that easy to make a proposal for annual meetings. I own roughly $30,000 worth of Apple stock so I'll have to mull over what I would propose at next years meeting. Anybody want to seconds a proposal for Apple to get back into the router business? Atleast it’s unlikely for Cook to be voted out at this meeting. I think it would take more than 1 year of bad financial results for the big institutional investors to push for either Changes on the Board or at CEO. But it would be interesting to see Scott Forstall on the Board or Tony Fadell.